Park Avenue soon will have a new limestone tower to join the ranks of the street's architecturally noteworthy buildings, from Lever House to the Seagram Building. Unlike those glass office buildings in the modern International Style, the 51-story building at 520 Park Ave. will feature vertical mansions clad in traditional stone at the edge of a neighborhood real-estate people have begun to call "Billionaires Row." The would-be district of the uber-wealthy extends from Broadway on West 57th Street to Park Avenue, as well as to a few other midtown locations. The building will join at least seven other condominium towers under construction or planned near or along 57th Street in Midtown, raising a concern by some brokers too many mega-condos may be coming on line in what has been the city's hottest real estate sector. It also will have a penthouse priced at considerably more than $100 million, according to a person familiar with the project, making it the city's most expensive apartment. "It is a new market category, it is being called Billionaire's Row," said Jonathan Miller, an appraiser and market analyst and president of Miller Samuel Inc. of the new development area. He said the demand for hard assets in the U.S. is so strong—especially among international buyers—that the market is likely to remain warm far into the future. But he added too many buildings coming to market at the same time could temporarily limit prices. Already, some brokers say sales have slowed at some fast-selling buildings after they repeatedly raised prices last year to levels that may be unsustainable. At the same time, Mr. Miller noted that the sheer size of the new apartments will effectively limit their supply—and support their high prices. 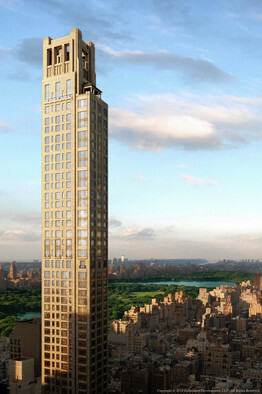 The new building at 520 Park, designed by Robert A.M. Stern, the dean of the Yale architecture school, was assembled by brothers Arthur and William Lie Zeckendorf and much of the same team that created 15 Central Park West. 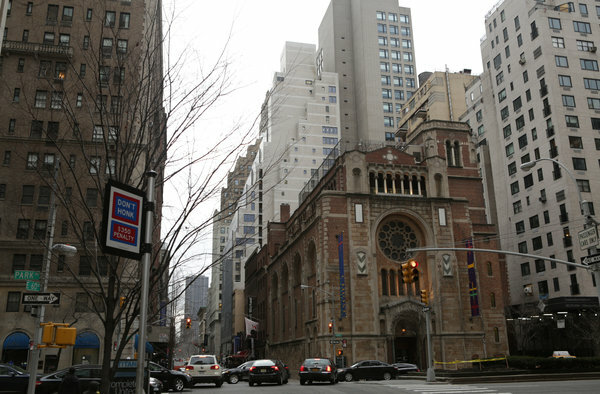 It grew to 178,000 square feet through the combination of several lots and the $30.4 million purchase of air rights from Christ Church at East 60th Street and Park Avenue. It also purchased the right to cantilever over much of the Grolier Club, a club of bibliophiles on East 60th Street. The developer obtained additional building rights by providing funding to build affordable housing on the Upper East Side as well as meeting the requirements of a city green building program, Arthur Zeckendorf said. The smallest of the tower's 31 apartments will sprawl over full floors of about 4,600 square feet. They will each have their own elevator landings and are set to list at $27 million or more. There will also be seven duplex apartments, each with six bedrooms. The largest apartment, a 12,400-square-foot triplex with a private terrace, will be priced at as much as $10,000 per square foot. In the new project, the Zeckendorfs formed a development company with two groups of real-estate investors: Rafael and Ezra Nasser, who had earlier purchased a six-story office building on the site with the Zeckendorfs; and Israeli investor Eyal Ofer, who had owned another building there. Foundation work is under way and the apartments are scheduled to go on the market in several months. But the large number of expensive apartments on the market is causing pause for some brokers. Although the number of listings in Manhattan shrank to the lowest levels in at least a decade, there is now about a 31-month supply of apartments and houses priced at more than $10 million, based on listing and sales figures provided by Greg Heym, an economist at Brown Harris Stevens and Halstead Property. These don't include high-priced apartments at new developments that aren't routinely shown in New York's main broker listing system. "In the midtown corridor you are entirely saturated with inventory," said Donna Olshan, a broker who issues a weekly report on luxury apartment deals in contract. Still, she said that the new Zeckendorf project on East 60th Street would do well, since it is on the lower fringe of the Upper East Side, where demand for large apartments remains strong by local New York buyers. Since the success of 15 Central Park West, she said, the Zeckendorfs have a track record and a following among apartment buyers. 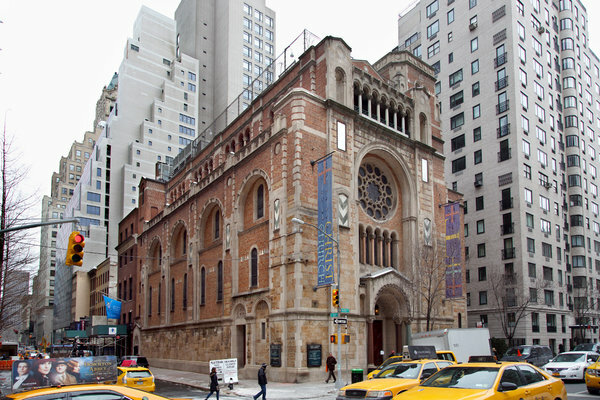 Although the new building will have a Park Avenue address, now used by the church, its entrance will be located a few doors down from Park, on East 60th Street, toward Madison Avenue. Christ Church, at Park Avenue and 60th Street, is selling air rights that will let developers erect a taller building behind it. Last edited by JCMAN320; March 26th, 2014 at 05:21 PM. Whereas Vinoly's Dreck tower is Italian fascist, Stern's tower is German fascist. isn't one of them Jewish? Maybe that's the secret political/subversive side that people keep missing about Bob Stern's architecture. In that light, as an act of appropriation, I can appreciate this "stern" tower a bit more. What does "German Fascist design" mean? If you're referring to Albert Speer's unrealized designs for Berlin during the Third Reich, they look nothing like this building. Those dilapidated tenements next door with cheap shops really detract from this tower. More obscene than ridiculous . Tear your eyeballs away from that ridiculous asking price for a moment: the rest of the building is made up of 23 full-floor units of about 4,600 square feet, which will start at $16.2 million. Seven almost-10,000-foot-duplexes will start at $67 million. Please note that the duplexes' planned listing price puts them squarely in the list of the 25 most expensive apartments for sale in the city right now. 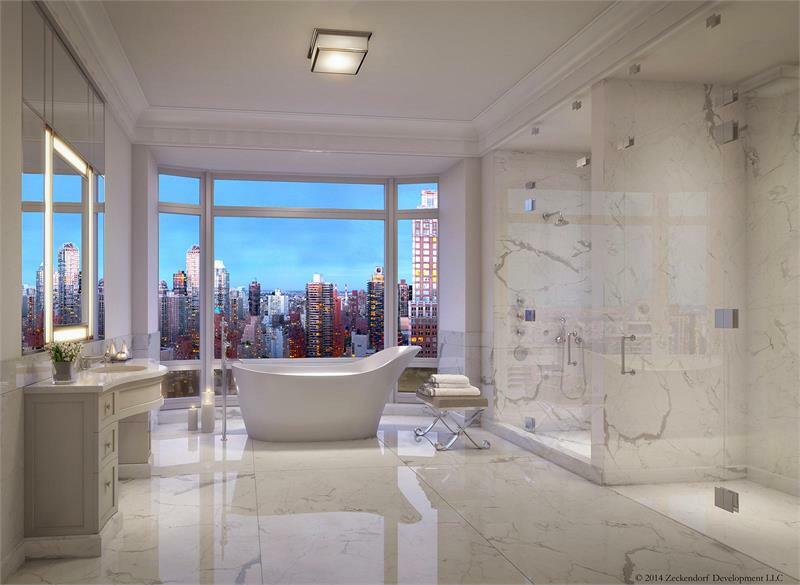 The penthouse, when it lists, will unseat the current record-holder: a trio of uncombined penthouse apartments at Battery Park City's Ritz-Carlton residences, which wants a mere $118.5M. Some rich billionaire philanthropist is going to purchase it for giggles and only use it on the weekends. That's what's been happening at all the other towers throughout the city. Weekends imply they'll be here on a regular basis. I think they'll stay there maybe one or two weekends the whole year, tops. Rest of the time, it will probably be given over to family, friends, etc. And a housekeeper to receive parcels and forward mail. Wouldn't take long for one to slip and hurt oneself on that floor . And what on earth does one do with all that space?! Perhaps install one's own personal gym equipment from which one could stagger the short distance into the shower?! The good thing about computer renderings is that you can alter perspective and proportions to make rooms look bigger. I'd like to see these new pictures against actual photographs in a few years. By rights, mail intended for future residents of a certain luxury condominium under construction on the Upper East Side should read “45 East 60th Street.” After all, the Grolier Club, which is right next door to the persistent din, is 47 East 60th Street. Letter carriers, please take note. Thanks to the purchase of air rights from its neighbors, and an $11,000 processing fee, the 54-story limestone building will be known as 520 Park Avenue. Christ Church, which occupies the corner lot, until recently claimed that exact address. Presumably, the house of worship had to junk a load of letterhead: Its new designation is 524 Park Avenue. “Most of the great buildings on Park Avenue end in multiples of 10, like 480 Park Avenue, 510 Park and 740 Park Avenue, and the developers are following that tradition,” said a spokesman for those developers, William and Arthur Zeckendorf. 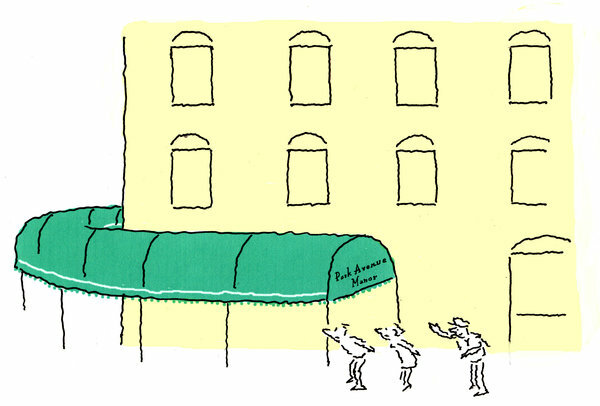 In the high-flying and logic-defying world that is New York City real estate, nothing succeeds like address. “All things being equal, an apartment on Park Avenue or Fifth Avenue can have a premium of 5 to 10 percent, compared to the immediately adjacent crosstown streets,” said Jonathan J. Miller, the president of the appraisal firm Miller Samuel. Consequently, developers frequently appeal to the office of the Manhattan borough president for what is known in the trade as a vanity address. the luxury condominium under construction behind it on East 60th Street. As for buildings in less prestigious precincts, well, there are ways of burnishing their addresses, too. Nearly two years ago, the Zeckendorfs laid out the case for a new address in a letter to Scott M. Stringer, who was then the Manhattan borough president. In other words, follow the yellow brick road — because there won’t be an entrance to 520 Park Avenue on Park, since the building has no frontage on Park. 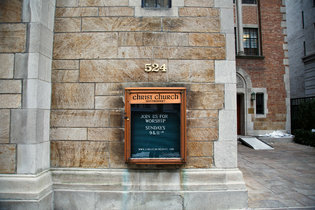 The new address for Christ Church is 524 Park Avenue. But 520 Park Avenue is not the only building to cause head-scratching and GPS-gazing. The principal entrance to the soon-to-be-completed high-rise 432 Park Avenue is on East 56th Street, although the site does have 75 feet of frontage on Park Avenue. 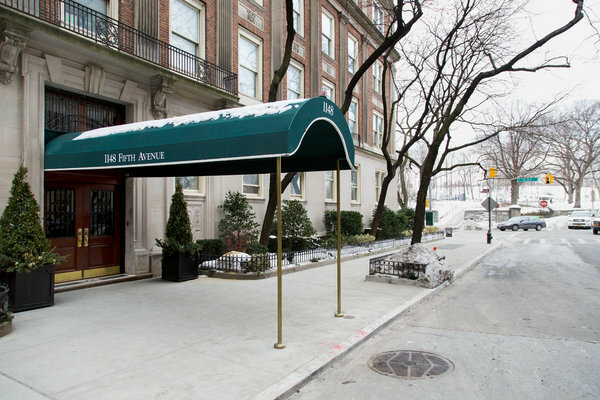 “They wanted to create a private and dramatic porte-cochère for residents and their vehicles, which wasn’t possible on Park Avenue from a design point of view,” said Richard Wallgren, the director of sales for the building, developed by CIM Group and Macklowe Properties. Meanwhile, 1049 Fifth Avenue, a prewar condominium, is halfway down East 86th Street with no frontage on Fifth Avenue at all. And many corner properties have their canopies on cross streets but hold tight to their Fifth or Park Avenue identities, among them 1140, 1148 and 1150 Fifth Avenue. A few buildings, sensing the confusion their address engenders, toss a lifeline: The side-street canopy for 1060 Fifth Avenue also reads 1 E. 87th St.
More to the point, perhaps, it’s a very cost-effective way of marketing a property to international buyers. Stuart Moss, an associate broker with Corcoran, said that when he handled the sale of Rush Limbaugh’s penthouse apartment at 1049 Fifth Avenue in 2010, some potential buyers were put off by the pretend Fifth Avenue locale. An awning proclaiming 1049 Fifth Avenue, which has no frontage on Fifth Avenue at all. It also can make for headaches, according to Gale A. Brewer, a former member of the New York City Council and Mr. Stringer’s successor as Manhattan borough president. “I don’t think there were any hard and fast rules in the past,” Ms. Brewer said. “The general concept was that developers would ask for addresses that were different from the obvious address, and my predecessors seemed to grant them.” Her office fielded 10 such requests last year. During her time on the City Council, Ms. Brewer said, she received complaints from people whose mail had gone awry as well as from baffled ambulance drivers. According to Elisheva Zakheim, a spokeswoman for the New York City Fire Department, when the fire department performs building inspections, “if they notice an entrance that seems strangely located, they’ll take note of it.” Similarly, emergency medical workers can file a “field feedback form.” Building residents, meanwhile, can be proactive and go to the nearest firehouse, “which will then log the information about their address into the system,” Ms. Zakheim said. Most of the building known as 1148 Fifth Avenue is actually on East 96th Street. Of course, in terms of prestige, not all avenues are created equal. Residential buildings that have an option often choose a side-street address rather than an address on, say, Lexington, Third, Second or First Avenue. A case in point is the Georgica, a condominium at Second Avenue and 85th Street that uses 305 East 85th Street as its address “because we thought it sounded better than a Second Avenue address,” said Mr. Gerringer, the marketing executive. 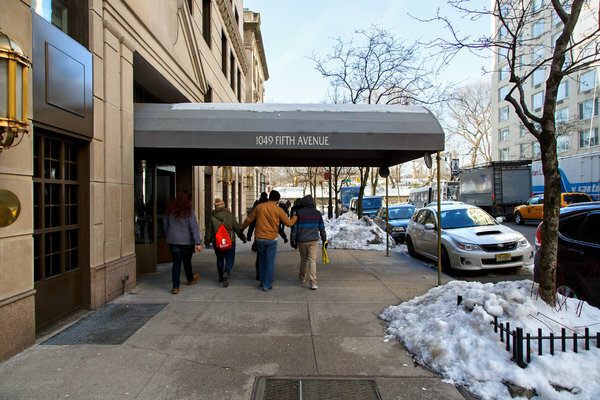 The Lucida, a condo at Lexington and 85th Street, went with 151 East 85th Street for much the same reason, according to Barbara Fox, the president of Fox Residential Group. “It just sounded like a more chic address,” she said. For some, even Madison doesn’t have quite the right ring. Ask the people at Douglas Elliman, who are marketing a low-rise condominium project at Madison Avenue and East 74th Street. Its address will be 33 East 74th. The Related Companies went a step further with a downtown rental property on Fourth Avenue and 14th Street. A Fourth Avenue address was a bit puzzling, said Greg Gushee, an executive vice president at Related, because “some people don’t know where Fourth Avenue is.” And, since a 14th Street address was a bit lacking in luster, the development was given the mythical address One Union Square South. “It both defines the location and connotes that it’s the premier building in the neighborhood,” Mr. Gushee said. P.S. The building’s lobby is on Fourth Avenue. 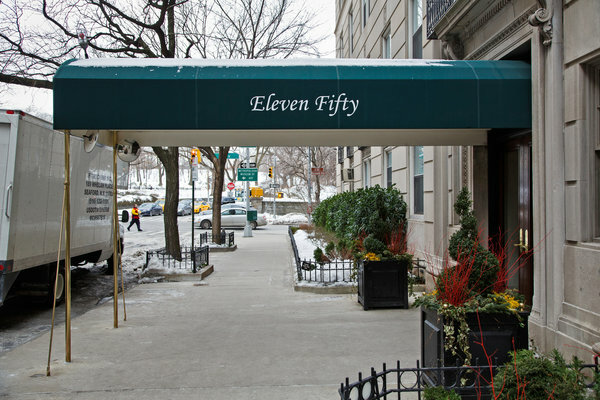 An awning for a building on East 96th Street shortens its official name, 1150 Fifth Avenue, to just plain 1150. Accordingly, the Lexington entrance was shuttered and the canopy moved around the corner. And it undoubtedly cut down on explanations and directional guidance to friends who were visiting for the first time. Ritzy or not, part of 1148 Fifth does indeed sit on the avenue, so it has a lot of brick backing up the address. But clearly that’s not always the case. “The question is ‘how legitimate is the claim?’ when there’s no entrance and absolutely no frontage on the avenue or street you’re claiming as your address,” said Mr. Steinberg of Compass. “In certain cases I think developers are really pushing it, and for some buyers it’s unacceptable.